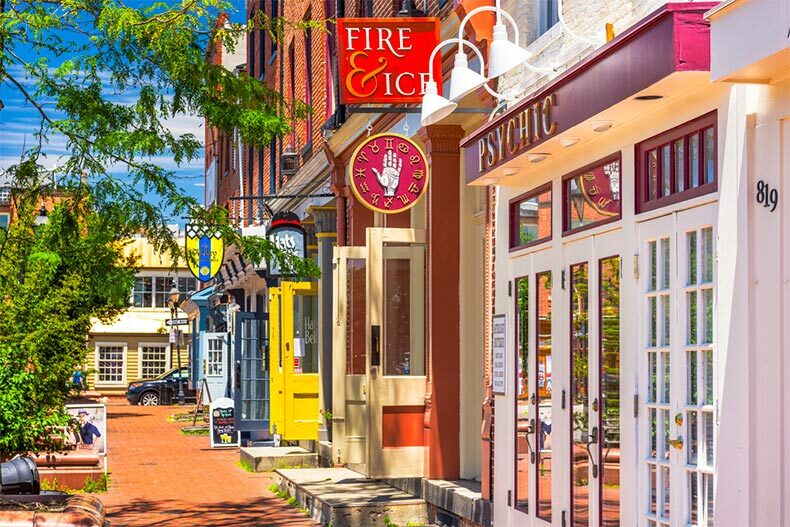 Baltimore is home to several quaint and historic shopping districts. Baltimore is an ideal location for active adults for many reasons. First, its proximity to several large cities, including Washington, D.C., Philadelphia, and the lovely beaches of Delaware. Second, Baltimore has plenty to offer on its own, including a thriving Inner Harbor, historic shopping districts, art, music and professional sports teams. Many of the communities for active adults are in the suburbs surrounding the city of Baltimore, including Gambrills, Columbia, Edgewater and Ellicott City. Here are a few highlights from some of the activities adult communities near Baltimore. Carroll’s Creek is an active adult community conveniently located halfway between Washington D.C. and Baltimore. Its location makes events in either city easily accessible. Carroll’s Creek consist of nine classic neo-Colonial style buildings that house a total of 162 luxury condos with a private balcony or patio. The community features dedicated biking and walking paths and is within walking distance to a commercial center that offers shops, restaurants, medical services and a supermarket. This active adult community also features a spacious clubhouse with a fully equipped exercise room, a multipurpose room, a game room and billiards. It also offers an outdoor lap and wading pool, a patio with BBQ area and scenic lakes and ponds. Residents have a choice of four designs at Carroll's Creek, with each condo unit offering 1,318 to 1,751 square feet of living space, spacious open-concept kitchens with customizable countertops, and a one-car garage located on the first level. Each condo building has two elevators. With such close proximity to golf courses, both the Baltimore Museum of Art and the Kennedy Center for the Performing Arts, Carroll’s Creek has something for every active adult. Snowden Overlook is an age-restricted community located in Columbia, a suburb of Baltimore and a 20-minute drive to Baltimore/Washington International Airport. Snowden Overlook is a gated community that consists of townhomes and condominiums available on a resale basis only. One of the main features of Snowden Overlook is the exclusive 11,000 square-foot clubhouse complete with a fully-equipped exercise room and an outdoor pool. The clubhouse also features a lounge, theater room, billiards, crafts, and meeting rooms. Snowden Overlook has 300 townhomes and a four-story condominium building with 50 units. The condo units are 1,500 square feet to 1,900 square feet and all have elevator access and individual parking spaces. Snowden Overlook’s townhomes are perfect for active adults who value low-maintenance living in private and spacious settings. The townhomes range from 2,400 square feet to 4,900 square feet, featuring two to four bedrooms, two to three-and-a-half-bathroom and an attached garage. The suburb of Columbia has plenty to offer active adults, including grocery stores like Wegmans and Costco, the Columbia Crossing shopping center, restaurants, and the vibrant active adult social scene in Howard County. Colonial Charles is an age-restricted, active adult community located in Waldorf. Like many of the other communities highlighted in this post, Colonial Charles is situated comfortably between Baltimore and Washington, D.C. In fact, Ronald Reagan National Airport is a reasonable 40-minute drive away. Colonial Charles is a low-maintenance community consisting of townhomes and single-family homes and an amazing array of amenities. One of the more popular amenities is the 10,500 square-foot clubhouse that features both indoor and outdoor pools, a fitness center. and sauna-equipped locker rooms. The clubhouse also features a ballroom and a catering kitchen, while the grounds have scenic lakes and walking trails perfect for staying healthy. Homeowners pay an association fee that covers yard maintenance and snow removal. Downtown Waldorf is just minutes away from the Colonial Charles community and offers active adults a diverse variety of shopping, restaurant and entertainment choices. Other nearby shopping options include the St. Charles Towne Center, St. Charles Towne Plaza and The Shops at Waldorf Center. Waldorf also offers active adults many recreational options, including the White Plains Regional Golf Course, the Blue Crabs minor league baseball games, and plenty of regional parks. Patapsco Overlook is an intimate active adult community, conveniently located between Baltimore and Washington, D.C. This age-restricted community has 80 condominium units that are available on a resale-only basis. The social hub at Patapsco Overlook is its 1,472 square-foot clubhouse that features a party room, catering kitchen, an onsite exercise room, a conference room, and an outdoor patio. The condos in Patapsco Overlook are spacious at approximately 1,455 square feet in size, offering two bedrooms, two bathrooms, walk-in closets, and balconies. There is ample parking for residents' convenience. Both Baltimore and Washington, D.C. are within short driving distances from Catonsville, thereby offering residents an enviable choice of activities from which to choose. Make sure you're getting more content like this by following 55 Places on Facebook, Twitter, and Instagram.